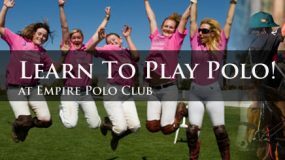 What to wear to a polo match? 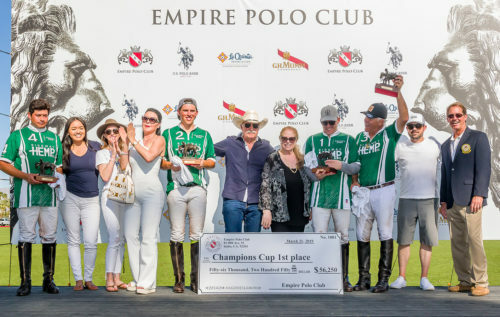 Two awesome, grand-finale matches wowed a huge crowd at the Empire polo grounds as teams battled for a chunk of the whopping $92,000 in prize money! The four-goal match kicked-off an incredible day of polo with Hanalei Bay (Krista Bonaguidi -1, Joe Coors 0, Ignacio Saracco 2, Luis Saracco 3) facing Empire (Rob Scapa 0, Riley Jordan 0, Kyle Fargey 3, Jessica Bailey 0). Joe Coors initiated the scoring with a penalty two conversion. Ignacio followed with a goal, putting Hanalei Bay in the lead at the end of the intense first time-period, 2 to 0. 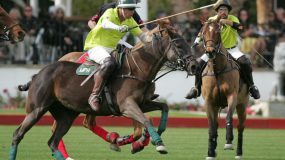 Kyle Fargey fought back in the second chukker with two goals. Joe Coors answered with two points and the first half ended with a 4 to 2 score. Empire came back with Fargey scoring a safety penalty shot. Joe Coors ran one in for a goal and Luis added a penalty two shot, ending the third chukker with Hanalei Bay in the lead 6 to 3. Empire continued to be a fierce competitor in the final chukker. Riley Jordan carried the ball through the Saracco brothers for a goal for Empire. Joe Coors made a penalty two shot for his fifth goal of the day. 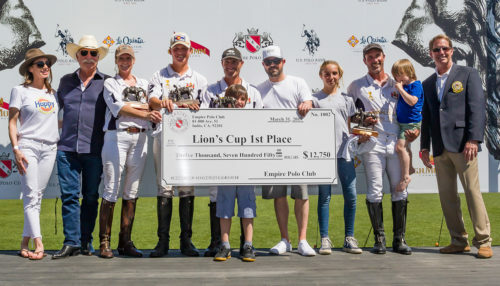 Hanalei Bay won the 4-Goal USPA Lions Cup Finals and took home a cash prize of $12,750. 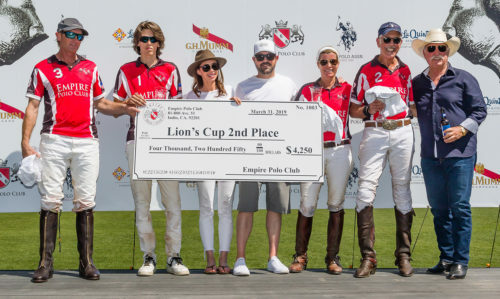 From left to right: Danielle Rubino of Classic Club, Alex Haagen III, Krista Bonaguidi, Joe Coors, Ignacio Saracco, Greg Rubino of Classic Club, Luis Saracco and family, and Scott Walker of the USPA. 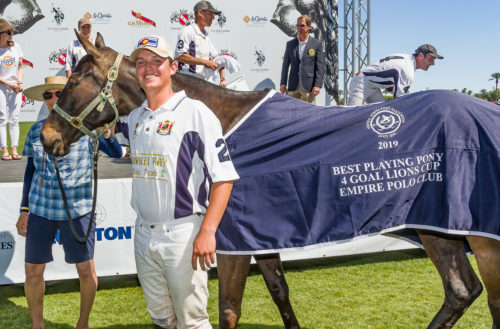 Empire Polo Team was the runner-up in the 4-Goal USPA Lions Cup Finals. They took home a cash prize of $4,250. From left to right: Kyle Fargey, Riley Jordan, Danielle and Greg Rubino of Classic Club, Jessica Bailey, Rob Scapa and Alex Haagen, III. Hanalei Bay won the bronzes and $12,750 with a final score of 7 to 4. The runner-up Empire team was rewarded for a valiant effort with a $4,250 check. The best playing pony was Maggie, owned and played by Joe Coors. The MVP award went to Luis Saracco. Best Playing Pony was Maggie, owned and played by Joe Coors. MVP Luis Saracco and Alex Haagen III. Spindrift (Omar Mangalji 0, John Bickford 1, Leandro Floccari 2, Juan Curbelo 5), took on Ridgway Hemp (Beau Staley -1, Quinn Evans 0, Carlos Hernandez 4, Memo Gracida 5). Both teams were out to win the 8-goal prize-money, and met at the line-up with intense determination. John Bickford put the first score on the board for Spindrift. 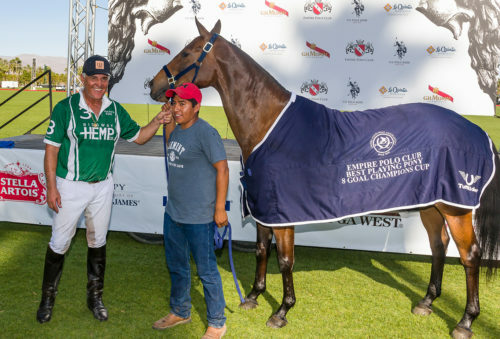 Memo answered with his first of seven goals and Carlos followed with two goals, putting Ridgway Hemp in the lead at the end of the first chukker, 3 to 1. 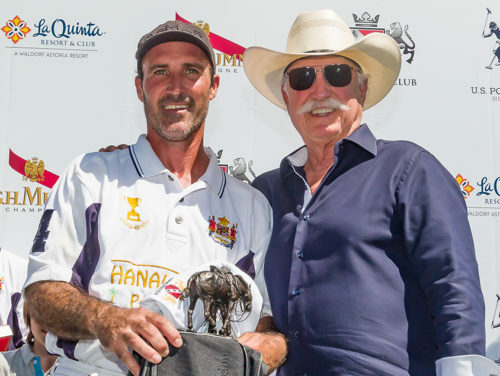 Hernandez scored one in the second time period, but Juan Curbelo was on fire and racked up four goals, which ended chukker two with Spindrift stealing the lead, 5 to 4. The third chukker was Ridgway hemp’s turn to retake the lead, and the teams went to half time with a close score of 7 to 6. Ridgway Hemp managed to put three more points on the board to Spindrift’s one in the fourth chukker, increasing Ridgway Hemps’ lead to 10 to 7. The trend continued in the fifth chukker which wound up 12 to 8. The final chukker was full of wide-open runs, furious plays, and spectacular polo. 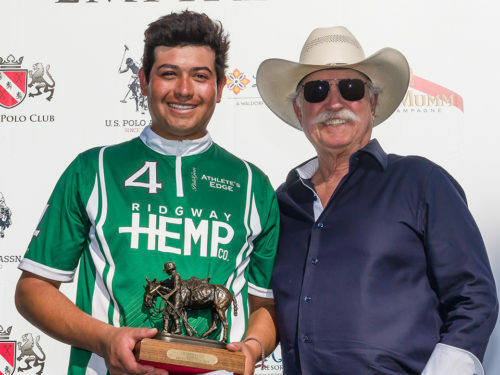 Ridgway Hemp won the 8-Goal USA Champions Cup and took home a cash prize of $56,250. 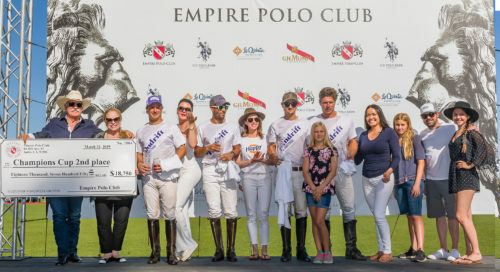 From left to right: Carlos Hernandez, Bianca Nolasco of EPC, Daniel Rubino of Class Club, guest, Quinn Evans, Mr. and Mrs. Haagen, Beau Staley, Memo Gracida, Greg Rubino of Classic Club and Scott Walker of the USPA. Spindrift was the runner-up for the 8-Goal USPA Champions Cup and took home a cash prize of $18,750. From left to right: Mr. and Mr. Haagen, Guest, John Bickford, Omar Mangalji, Danielle Rubino of the Classic Club, Juan Curbelo, Guest, Leandro Floccari Bianca Nolasco, Guest, Greg Rubino and Jaelyn Moraga of the Classic Club. After scoring three un-answered goals, Ridgway Hemp was the team of Champions, winning the $56,250 and the bronzes with a 15 to 8 final score. Best playing pony went to Stripes, owned and played by Memo Gracida. The MVP was Carlos Hernandez. MVP Carlos Hernandez and Alex Haagen, III. Best Playing Pony Stripes, owned and played by Memo Gracida.